DEAL OR NO DEAL started taping it’s new daytime version May 21st. A few major changes have been made to the favored prime time game show. First, and foremost, MODELS! The twenty-six beautiful ladies that grace the stage weekly, have been immensely narrowed down to just two- Patricia, and Tameka. The game is played slightly differently. A pool of 22 contestants stand in place of the usual 26 models, each with their own case. 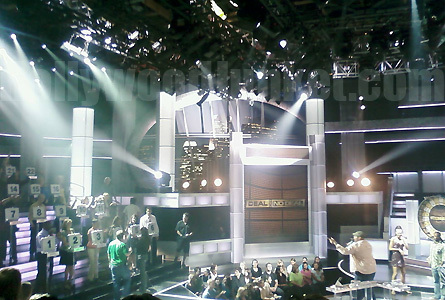 One contestant is chosen from that pool to ascend to the stage to play the game with Howie hosting. Contestants are chosen randomly through the luck of a ball landing on their number in a wheel that is spun by Patricia Kara (#9), and Tameka Jacobs (#21). From there, the contestant plays the game traditionally. Only, instead of having a chance to win $1 million, the highest amount on the board is, $500,000. The Banker is still very much present, and a lot stingier, offering a lot of low amounts. If you want to win some serious cash on this show folks, better stick to getting onto the prime time one. This version moves a lot quicker. It’s lighter and only a half-hour.